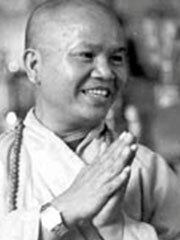 Dr. Thich Thien An (September 1926 — November 1980) was an influential teacher of Vietnamese Zen Buddhism who was active in the United States. Dr. Thich Thien-An came to the United States from Vietnam in the summer of 1966 as an exchange professor. He taught philosophy at the University of California, Los Angeles. His students discovering that he was not only a renowned scholar, but a Zen Buddhist monk, as well, convinced him to teach the practices of Zen meditation and to start a Buddhist study group on the campus. Several years later, his enthusiastic followers encouraged Dr. Thien An to apply for permanent residence and open a meditation center that included a place for practitioners to live. He founded the International Buddhist Meditation Center in the Koreatown section of Los Angeles, California. Once established, Thien-An taught the traditions of Buddhism at his center. In addition, he taught Eastern Philosophy and Asian Studies at Los Angeles City College. He retired from teaching at the college when he was dignosed with liver cancer in 1979. He continued teaching at his center until he passed away in 1980, at the age of fifty-four, from cancer which had spread rapidly throughout his body, from his liver to his brain. The International Buddhist Meditation Center he founded, continues to thrive. Thich Thien An was the author of the book Zen Philosophy, Zen Practice (ISBN 091354633X). We all shed salty tears and shed red blood. All is one. The beauty of Zen is found in simplicity and tranquility, in a sense of the all-embracing harmony of things. The ocean of suffering is immense, but if you turn around, you can see the land. Since everything is interrelated, since all things depend one upon another, nothing is absolute, nothing is separate, but all are part of the one indivisible whole.